« New Prints in the Etsy Store. Just got back my first two finished ceramics pieces from this term. I did these ones at home so Im very relieved they have survived all their travelling to get back here in one piece. This little Pierrot is just about to get a bit of sanding down, then I will glaze her and take her in to class for a firing, that ruffle was sheer Hell to make by the way so I hope she doesnt explode in the kiln! I have a bunny head to pick up this week too, I do love doing ceramics! This entry was posted on Wednesday, August 4th, 2010 at 3:56 pm	and is filed under Uncategorized. You can follow any responses to this entry through the RSS 2.0 feed. You can leave a response, or trackback from your own site. Your ceramic pieces are darling! I can’t wait to see the other piece finished either. I never even thought you could make such adorable pieces from ceramic! I know, I thought ceramics was so technical and really it isnt at all! I am so totally wanna see your bunny head! 😀 All are very adorable and very you! Great job Christina! I type too fast my fingers get in the way! I totally love the batgirl! are you gonna sell it?? OH!! These are SO ADORABLE!!! I LOVE THEM!! The ceramics world needs some new fresh loveable work like yours!! Keep experimenting – A print with a matching ceramic piece would make any room shine!! Oh wow, these are so fantastic! 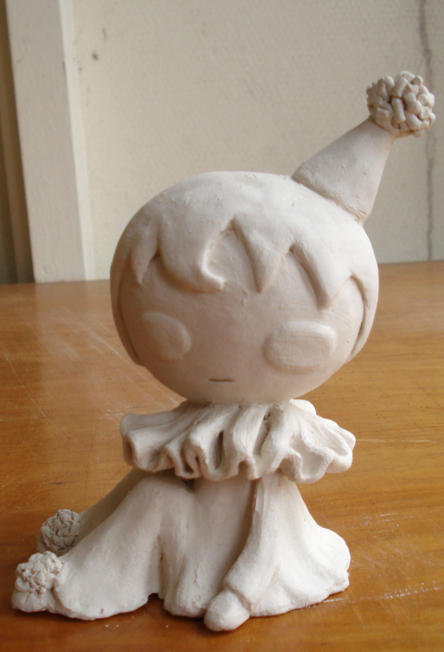 I can’t wait to see little Pierrot glazed. The ruffle was worth the trouble because it looks great. Oh my gosh, they are both incredible! The glaze colors are so rich. Really wonderful, can’t wait to see the bunny and Pierrot finished. Oh I love that bandit in a tutu! “No I amn’t” when I should! ooops sorry that was bandit AND batgirl in a tutu.